Best Greater Boston Business Technology Trends of the Future – Synivate, Inc.
At least once a year the “powers that be” in the tech world gather to discuss new ideas and talk about coming tech trends that will help to shape business in the coming years. One of those industry giants is Deloitte, which began sharing tech trend data just ten years ago. In their first-ever report, they focused on future trends which are today a reality, including the advanced popularity of smartphones and mobile apps, Internet of Things (IoT) and cloud computing. 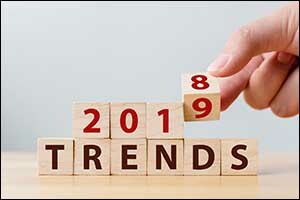 Considering some of the future trends that they have listed in their 2019 report, one can only wonder when those ideas will fully take shape and how they will affect Greater Boston IT solutions and demands for monitoring management services. Our technicians at Synivate work to stay ahead of the curve, so we can provide solutions designed to adapt to the Greater Boston business technology trends that matter to our clients the most. While we are already hearing a lot about companies using 5G, mesh networking technology, and edge computing to their advantage, Deloitte imagines the different ways that these connectivity advances will transform the way that companies do business. The formation of new products and services are a possibility, as well as the ability to complete tasks much more effectively and efficiently than before, thanks to greater connection speeds and opportunities. The influence of high-speed connectivity and Wi-Fi everywhere for businesses and consumers will also be felt in the areas of Internet of Things (IoT) business strategies. One of the areas that was most interesting to us here at Synivate, is the idea that DevSecOps will drive strategic changes in the way that cybersecurity, privacy, and risk management are viewed by businesses. Instead of being compliance-based, Deloitte imagines that it will become an essential framework due to the influence of things like connectivity, intelligent interfaces, serverless technology and other Greater Boston business technology trends. Infrastructure monitoring services and other network security and IT solutions will vital to protect businesses from external attacks and internal risks. Mentioned above as one of the reasons why businesses will need to amp up efforts for security and risk management, intelligent interfaces are currently changing the way that people interact with computers and data. Advanced devices and machines will become more commonplace in the average home, providing access to augmented reality (AR) and virtual reality (VR) experiences in a whole new way. Computer vision conversational voice and auditory analytics will also play a part, making future technology even more human-centric than ever. Greater Boston IT solutions will likely take advantage of this trend and figure out new ways to employ it for business and as a way to interact with consumers. Deloitte discusses what might happen when cloud computing hits the next phase of its evolution. In a world of NoOps, serverless technology will continue to grow, helping businesses to automate management tasks and reduce the time spent by techs on IT responsibilities and provide more opportunity to work on other projects and solutions. Much of the manual work that is done today could very well be automated in the future, providing businesses and monitoring management services with the resources to take technology to the next level. All of this is a positive change for business, offering more time to work on the things that matter most. While we are already beginning to see AI at work in the business world, crossing over into daily processes, products, and services, Deloitte sees the trend increasing in the future. While technologies that are already being used will grow in the way that they influence business, including machine learning, RPA, cognition, and natural language processing, other processes will be developed to take it even further. Some of the areas that will benefit the most include predictive analytics, diagnostic analytics, and automation, all of which can help businesses make a marked improvement. The more average, everyday users embrace the idea of AI in their daily lives through interactions with smartphones and other devices, the more this technology will expand in the business world. No one knows for sure what we will experience in the world of business in the future, but most of the predictions listed by Deloitte make perfect sense. The best way to prepare for changes in Greater Boston IT solutions is to partner with a technology service like Synivate. Our team of highly trained and experience consultants works hard to stay on the cutting edge of Greater Boston business technology trends, and we can help you get ahead of the curve with our consulting, security, and infrastructure monitoring services. Whatever you need to help take your business to the next level, you can count on Synivate to help you get there in style. Give us a call at 617-517-0704 or contact us through our website for more information.